On the 8th of March, the operator of NSW’s land titles registry, NSW Land Registry Services (LRS), received the last consignment of Old System Deeds images from DFSI. This, and the last transfer of original registers to the NSW State Archives and Records Authority (SARA), marked the official completion of the Old System Deeds project. Since the project commenced in 2010, Spatial Services and LRS’s predecessor, Land and Property Information (LPI), have digitised and transferred over 38,000 Old System Deed registers. We now have a complete digital representation of Old System land registration in NSW, dating back to inception of the Old System in 1842. 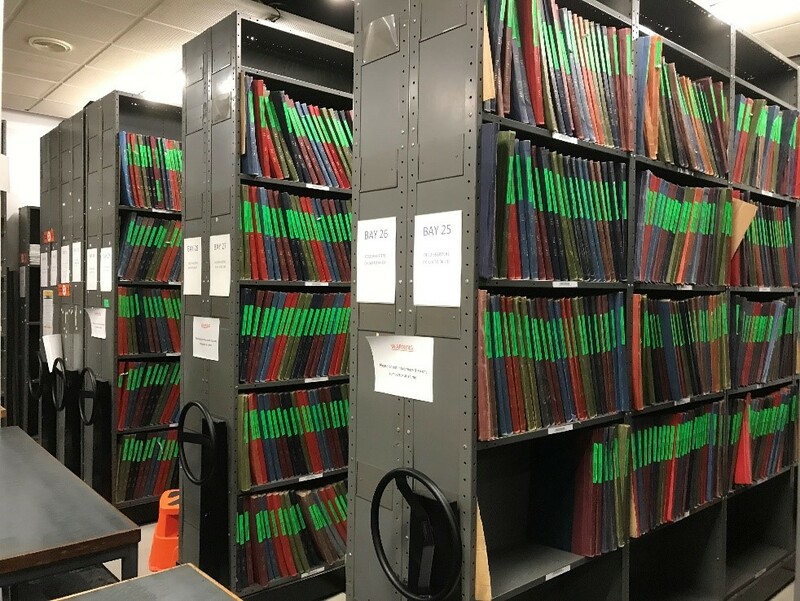 Digitising the entire collection means the public can access these records online via LRS’ Historical Land Records Viewer and approved Information Brokers, rather than having to view physical records in person. It is now much easier for the public to obtain information about land ownership in the early colony of NSW. This milestone has been the product of nine years work, most recently under the management of Matthew McRobert, Vincent Muller and Kim Neil of Spatial Services. The final 18 months of the project was funded by LRS and overseen by Libby Abraham at the Office of the Registrar General, and the entire project has been a principal example of government agencies, including those in regional offices, working together towards a common goal. A small number of the 38,000+ Deeds registers which were processed as part of the Old System Deeds Project.